On a beautiful April morning, on the campus of an elementary school in the Silicon Valley, just after the school start time, while the whole school went from the hustle and buzz accompanying drop off into a total quietness, at this corner, however, happy chatters and bursts of laughs could be heard some distance away. Getting closer, one could see it was a class of 4th grade kids going to start on a veggie garden. They were all very excited. It was not their first time they did something related to a garden though – they did it before, kind of. 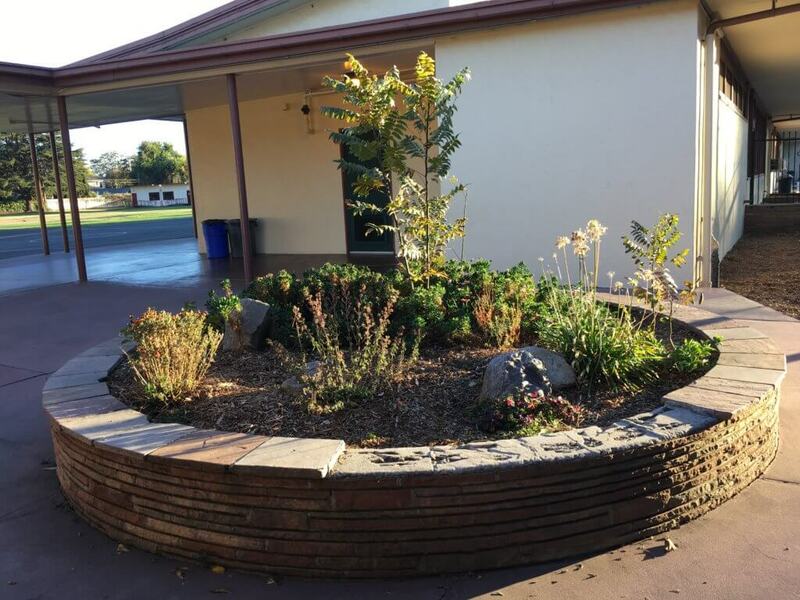 2 years ago, when California was still in the historic 5-year drought, in response to the call of conserving water, the school reduced the watering for its garden. Like so many gardens across the area at that time, a big part of it went barren. After the drought was over, though it was with a good reason, the garden could be improved. Finally a proposal was made, “Let’s do something!” It happened that at the time the kids at 3rd grade were learning about water and water conservation as part of the curriculum. Why not let the kids be involved in the garden? 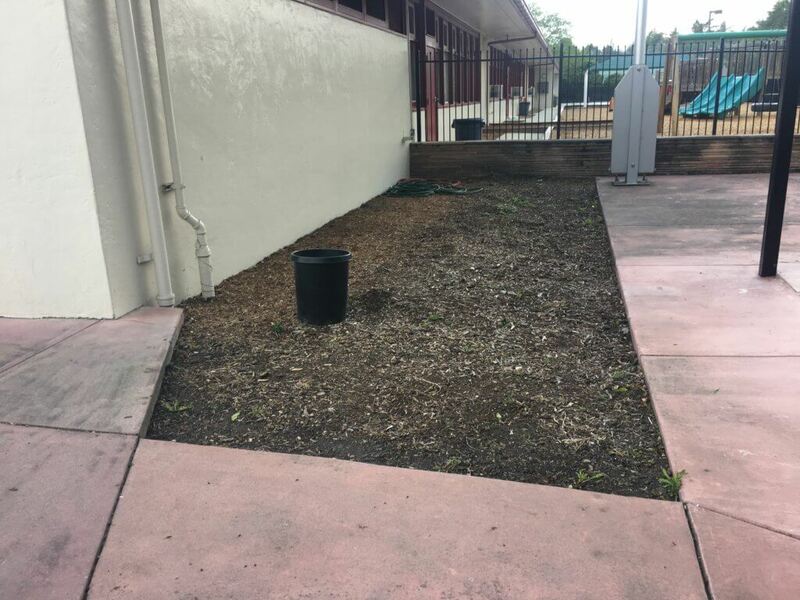 After all, after the project was to be finished, they would see it the most; and, this would be great education for gardening, and water it would take. After half hour of shouts, exchanges and laughter, the plants were decided on. The list was sent to the principle, and the garden was planted. Another year went by, by spring, the garden has completely been filled in. It was lovely, all plants were blooming in the spring breeze. From time to time, parents and kids could be spotted pausing to take in the view before hurrying away into a busy day. The 3rd grade kids are now in their 4th grade, and they were assigned another research project for water conservation. Another class discussion about water was held; at the end, everyone went out to take a look at the garden, something that they discussed and designed a year ago. Once in in front of the garden, kids all got excited. They asked about the names of the plants, remembering what they commented back then, shouted, laughing. Definitely. 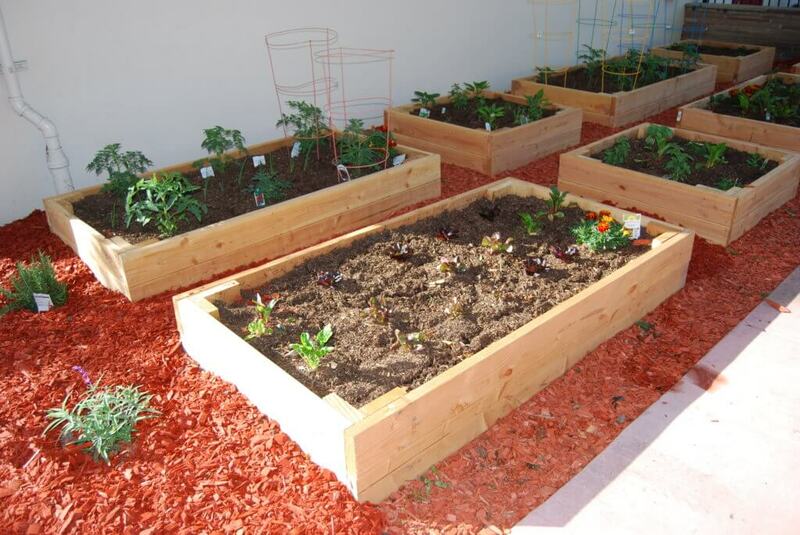 Actually, it can be a veggie garden! 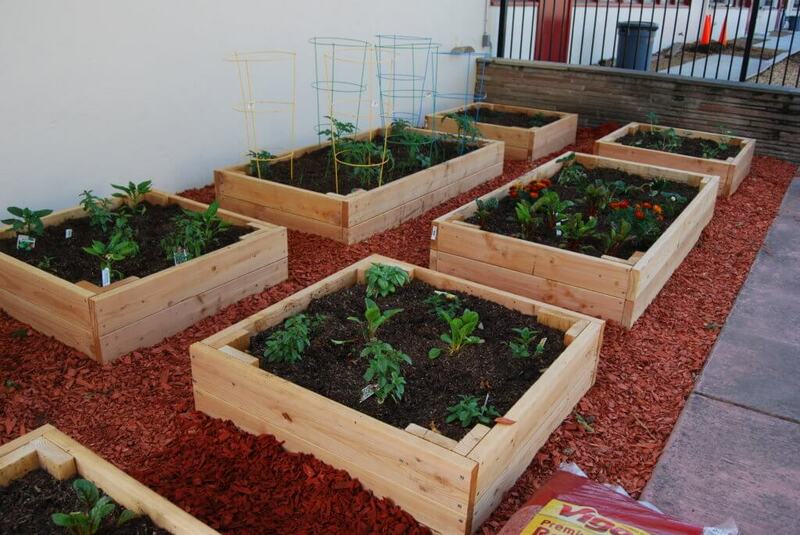 Kids can get so much out from building and growing a veggie garden. 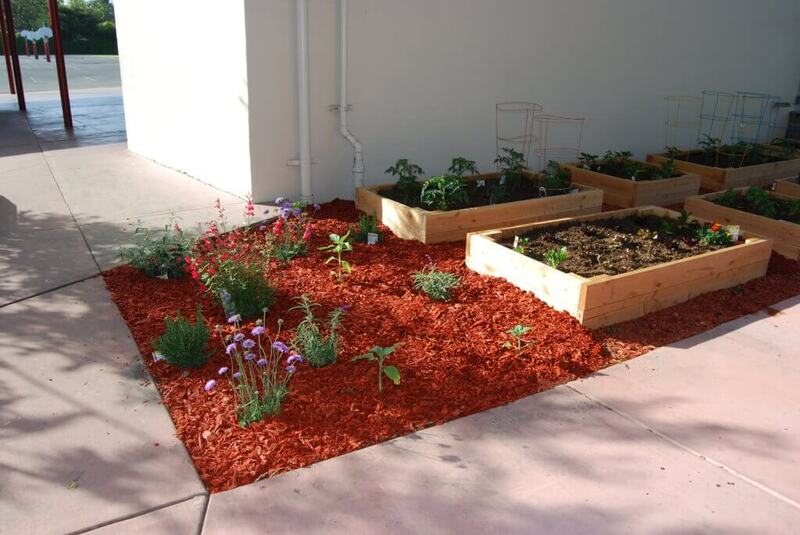 Improve understanding of science – The gardening process involves a lot of STEM knowledge. To plan for a garden, the first step is to find out its size. To that end, one needs to measure, and calculate – that is math right there. For plants to grow well, it needs good combination of water, sun and soil. That is botany. What is in the soil? How to make it fertile? Chemistry. In a garden, these subjects are not just some dry concepts in the book, but something kids need to apply to tackle problems in the real world. 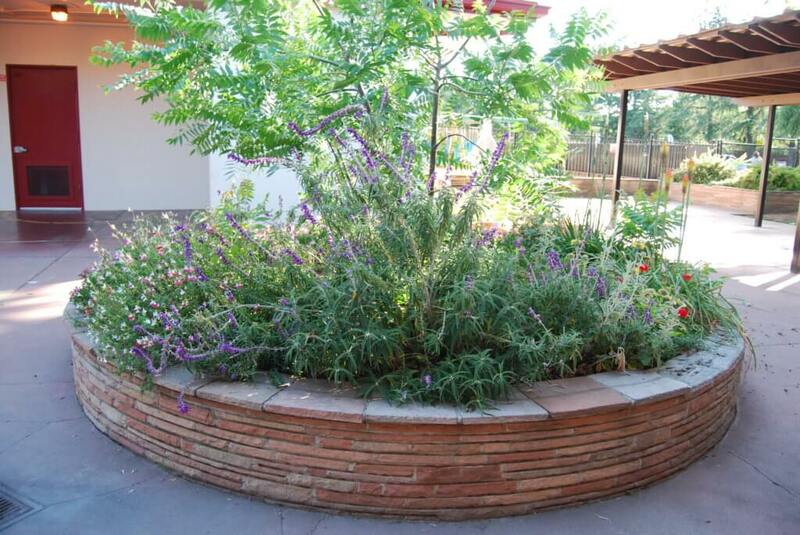 Team work and communication – it is a team effort, from designing, planting to caring for the plants. 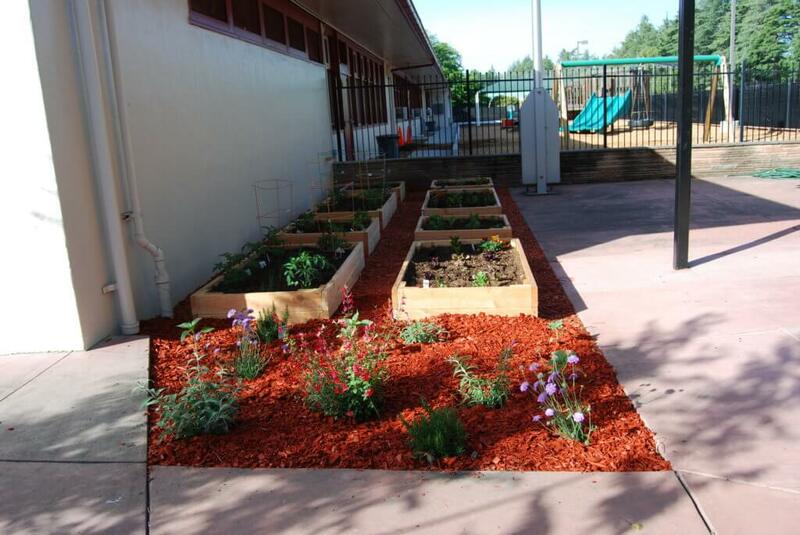 In the process, kids need to communicate, coordinate, do their own parts well, and come together to deliver a wonderful garden. As the process usually takes several weeks to months, it provides ample opportunities for team-building. Connection to nature, and food – nowadays a typical day for a kid is filled with books, homework and screen times of mobile phones and computers. There has been less and less outdoor time. When they are eating, very few would know how all the food are like when they were grown on a farm. By growing their own veggies, kids get to see the nature up close, and see how the veggies are before they become their food. That can be a rich and rewarding experience. Value the food, eat healthy According to State of Obesity, “The latest data show that the national childhood obesity rate among 2- to 19-year-olds is 18.5 percent.” In other words, almost one in every 5 children are obese today. That is an alarmingly high number. While there are many ways to tackle the problem, one of the ways is to let kids eat healthier, both quantitatively and qualitatively. By growing their own veggie, kids will come to value their food much more, eat the healthy portion, and more likely to enjoy their veggies. 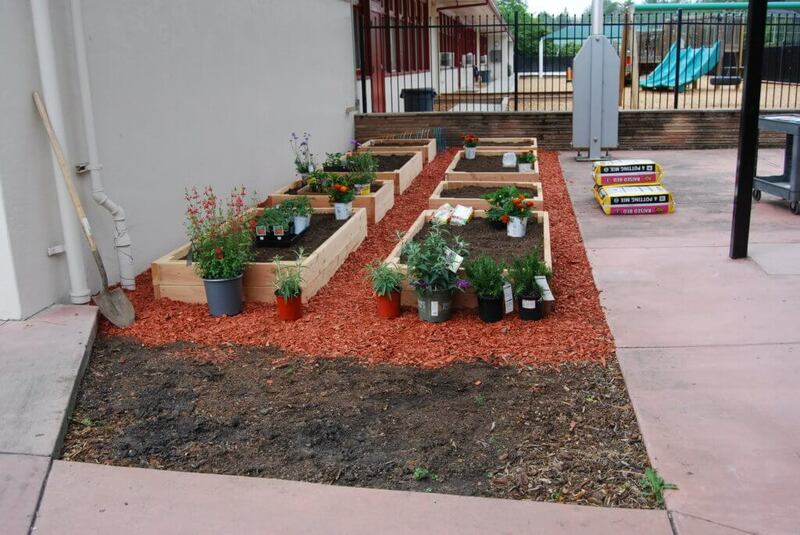 Just like last time, kids played a big role in designing the garden and deciding on the veggies to plant. Once the design was done, the project went underway. 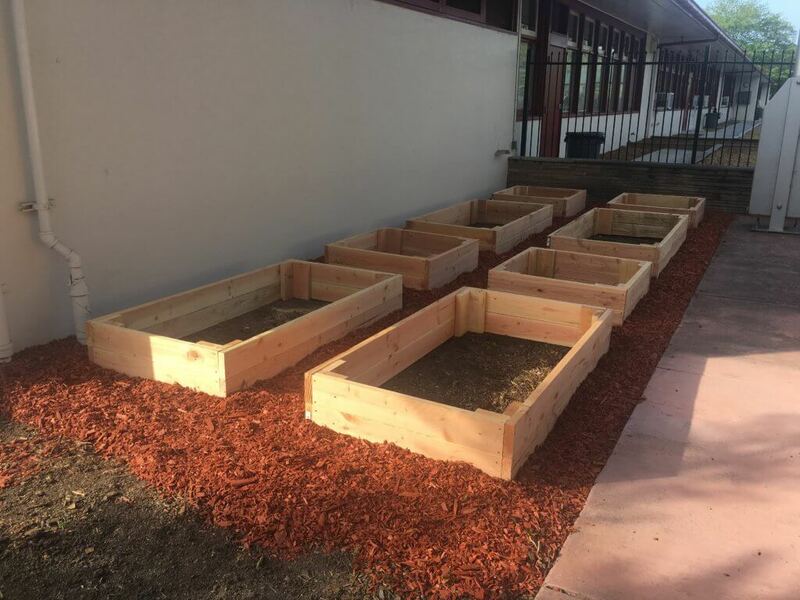 Veggie beds were built, soil added, seedlings were purchased. All was ready for the planting day! After some instructions were given to the kids, the planting started! 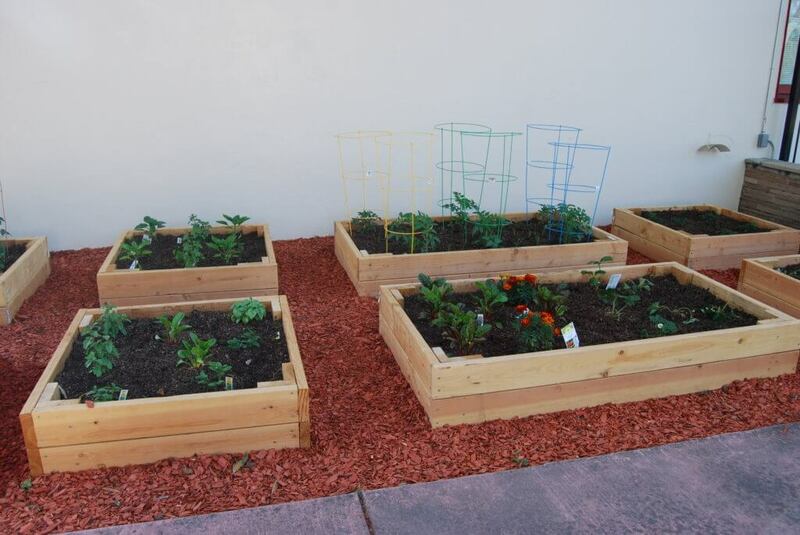 Spinach, chard, tomato, strawberry, basil… very soon all the seedlings were planted. 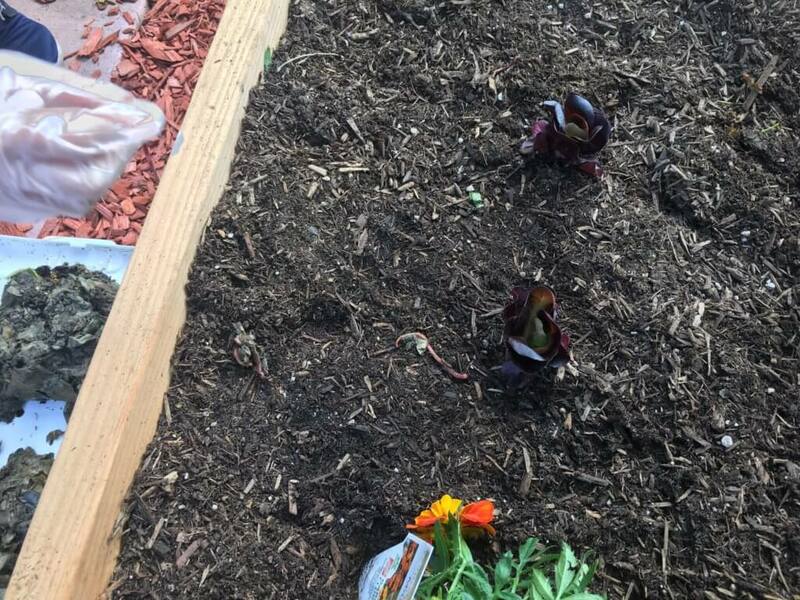 A science teacher brought a box of the worms, kids just scooped them up and put in the soil. They loved the worms! 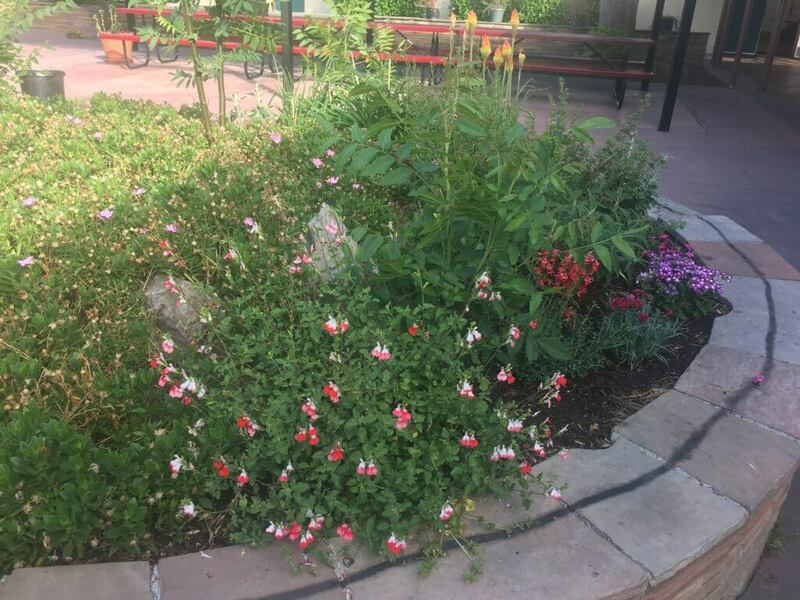 Then they helped put some plants in an empty area around the veggie beds, which were all drought tolerant, and would have blossom that attract bees and butterflies. 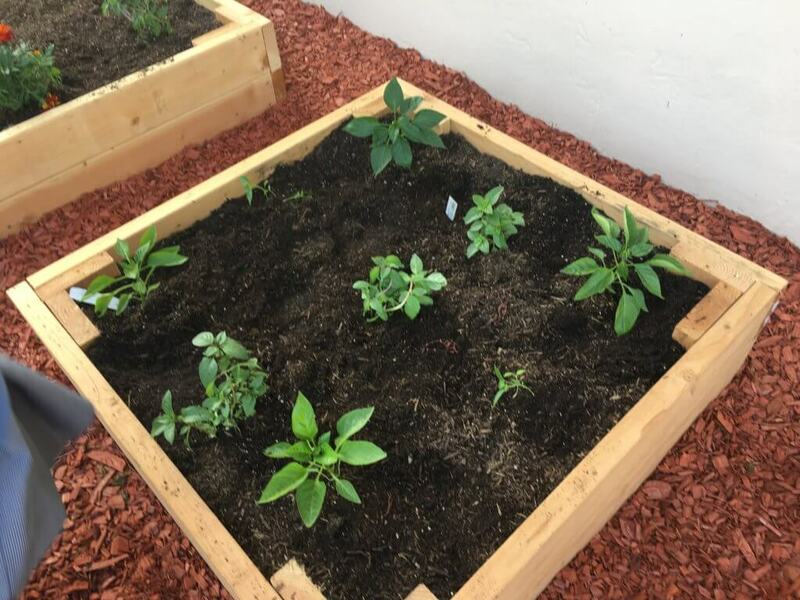 With these plants, the space will not only look more appealing, but also attract the pollinators that can help the veggies. All all the seedlings were planted, kids found the plant labels and put them next to each of the plant. They wanted to learn about the plant names, and wanted the labels there for future reference. Finally all was done! Everyone were very happy with the beautiful new garden. All it takes now is the time for the veggies to grow, and some care and watering. 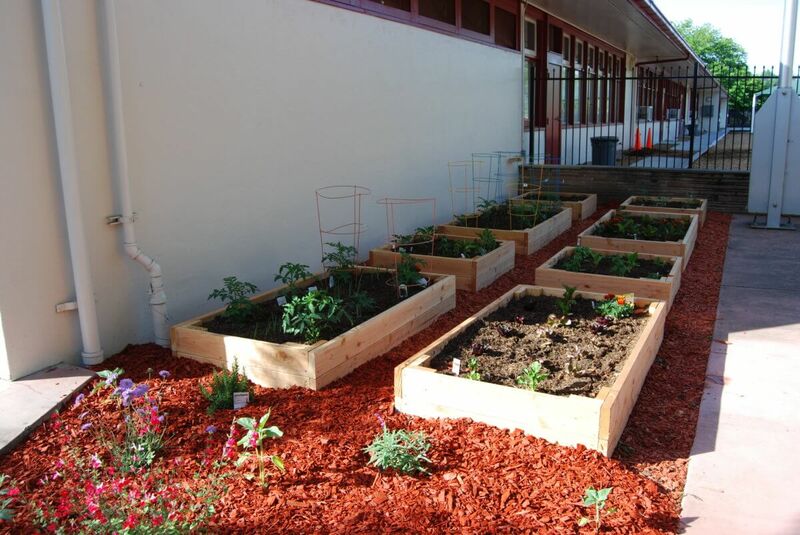 Now the kids can sit back a little, watch the veggies grow, and wait for the harvest time! In the weeks since planting, the veggies have all grown well, and grown up. The end of school year was fast approaching. A party would be held to celebrate. 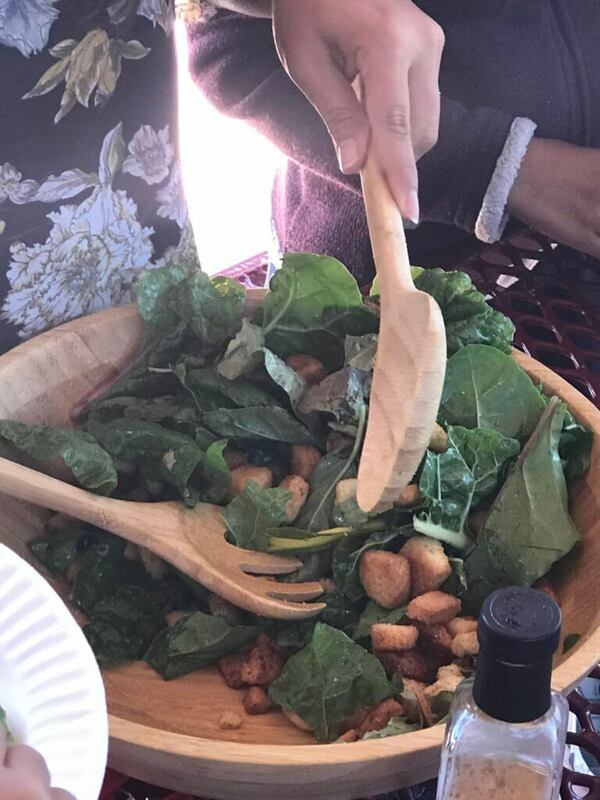 Any idea for food at the party? When they were asked to write down the best memories from the last school year, all kids wrote about the garden. 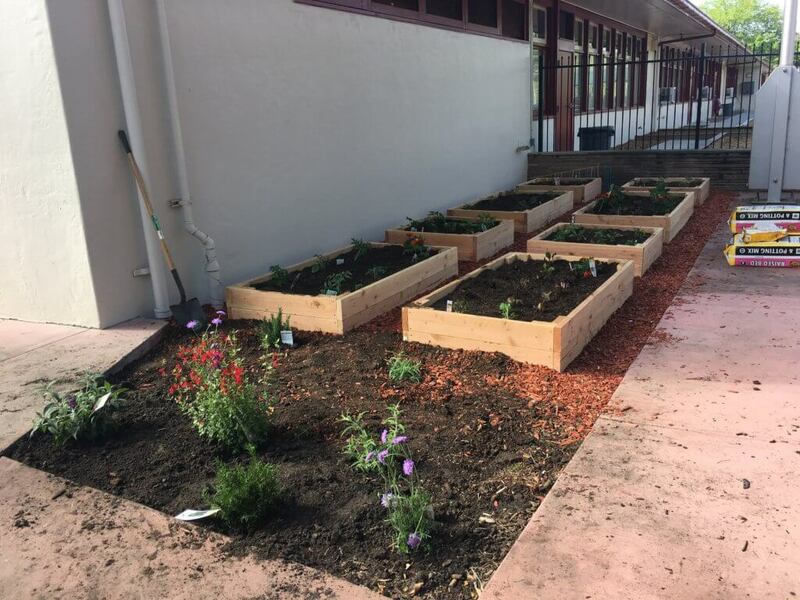 One kid said, ” “It was nice to see our work come to fruition” Another: “I love seeing the garden every day as I walk and leave school”. 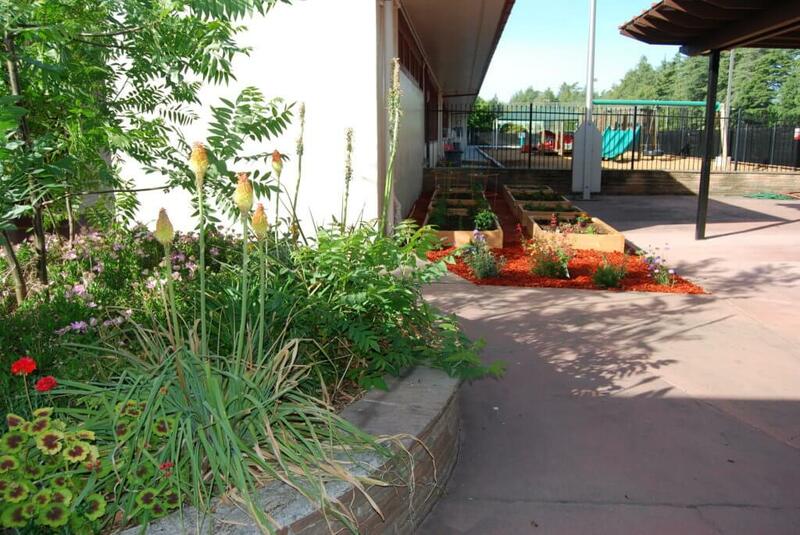 And this one: “”I am so proud of making our school beautiful and leaving a part of me here, forever”. 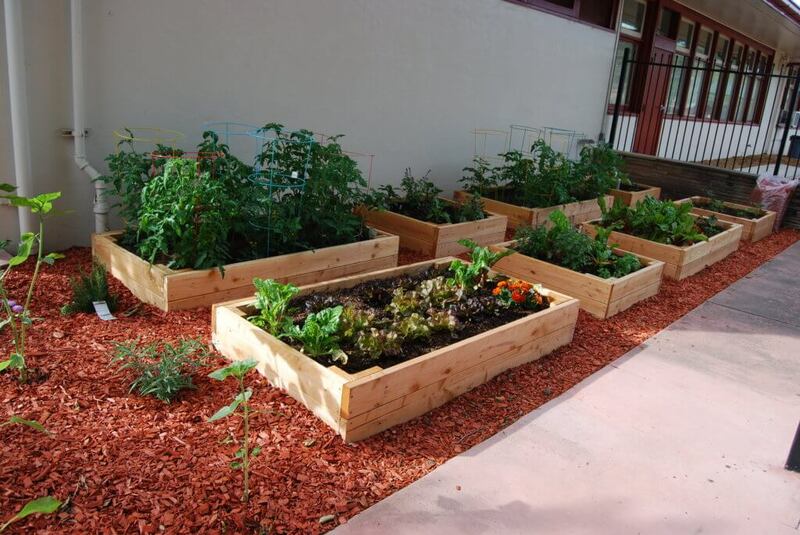 Veggie garden not only gave kids some salad, but an experience that they cherish and love.